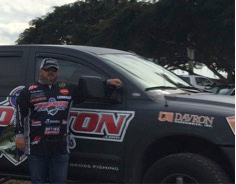 Davron Technologies will be partnering with Buddy Gross, professional angler, as he tours the country competing against other fishing champions. Our partnership with Buddy Gross represents a unique advertising opportunity for our brand. We believe he'll represent Davron well. Davron Technologies, Inc. is excited to announce its partnership with Buddy Gross Fishing. Buddy Gross of Ringgold, Georgia will be competing in his first full year as a professional on the Fishing League Worldwide (FLW) tour. By finishing in the top ten of the 2015 Costa FLW Series – Southeastern, he was able to secure this opportunity. Buddy will be fishing six tournaments around the United States with the hope of qualifying to fish in the season-ending Forrest Wood Cup in Huntsville, Ala. He will be competing against 171 other professionals on the FLW tour roster, which includes 10 Anglers of the Year and eight Forrest Wood Cup champions. “We are proud to partner with Buddy Gross for the upcoming 2016 FLW Tour season,” said David Craft, Executive Vice President of Davron Technologies, Inc.
“The industrial process equipment Davron Technologies manufactures is very impressive,” said Gross. “After spending some time around their factory, I have developed an appreciation for their quality product and look forward to working with them going forward,” he added. In addition to Davron Technologies, Gross has teamed with Fish Dayton as his title sponsor as well as Bullet Boats, Eagle Testing, Ride Hide Wraps, Power Pole, P-Line, Dayton Boat Dock and Grill, Zoom Bait Company, Tennessee River Tackle Company, T-H Marine, The Tackle Trap, Fringe Tackle Company, Hog Farmer Bait Company, OPTIMA Batteries, Mercury Marine, and Hammer Fishing Rods. You can follow Buddy and his progress throughout the season on Instagram @buddygrossfishing and on his Facebook page, Buddy Gross Fishing. Davron Technologies, Inc. custom fabricates industrial ovens, providing turnkey design and system integration services to develop thermal processing solutions for every industry requiring thermal processing. Each Davron industrial oven is built according to customers’ unique specifications. Davron offers one of the largest selections of in-house and on-site industrial oven services in the world.